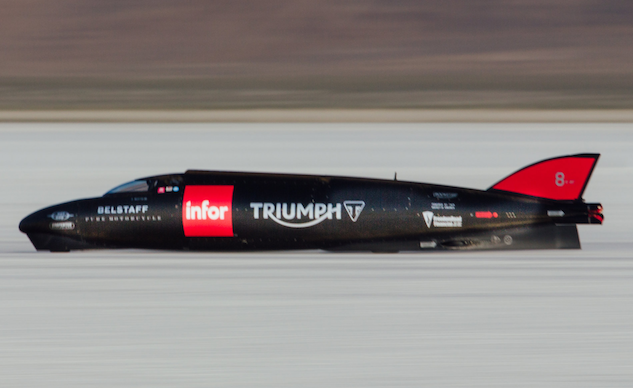 Press Release from Triumph: The Triumph Infor Rocket Streamliner has become the world’s fastest ever Triumph by achieving a speed of 274.2 mph at the Bonneville Salt Flats on August 8, 2016. 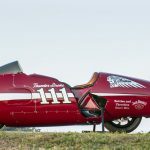 Piloted by TT legend Guy Martin, the streamliner smashed the previous official Triumph record that stood at 245.667 mph as well as the unofficial Triumph Record of 264mph, both set by Bob Leppan, in the Gyronaut X-1. Near perfect conditions greeted the team on the final day of the team’s land speed practice week. 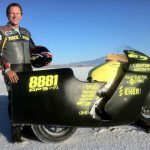 With confidence high after a successful number of days running on the salt at Bonneville the team’s goal for the day with the Triumph Infor Rocket Streamliner was the Triumph record. Just after 8:30am Guy Martin and the team set off on the first run of the day, after a steady start, Martin accelerated the sleek looking streamliner to a staggering 274.2 mph, rewriting Triumph history in the process. Just after the two-mile marker Martin came to a controlled stop near to the team’s base camp to be greeted by the news that he had broken the 46-year- old Triumph record. Today’s record run is further proof of Martin’s growing confidence on the salt and commitment to breaking the World two-wheeled Land Speed record. Throughout the week Martin has continued to impress everyone within the team with the speed in which he has been able to master the Triumph Infor Rocket Streamliner on the salt. Each time Martin has sat in the streamliner on the salt he has been able to achieve the goals set by Crew Chief and the Triumph Infor Rocket Streamliner designer Matt Markstaller and his team with the required level of control. Triumph has a history of breaking the land speed record, holding the title of ‘World&#39;s Fastest Motorcycle’ between 1955 to 1970*. The record-breaking Triumph Streamliners included: Devil&#39;s Arrow, Texas Cee-gar, Dudek Streamliner and Gyronaut X1, the former achieving a top speed of 245.667 mph (395.28 km/h). Today&#39;s record, held by Rocky Robinson since 2010 riding the Top Oil-Ack Attack streamliner, sits at 376.363 mph (605.697 km/h). The iconic Bonneville name was conceived following Johnny Allen’s land-speed record runs at the Salt Flats in September 1956, when he reached the record breaking speed of 193.72 mph. 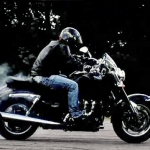 The first T120 Bonneville model was unveiled at the Earls Court Bike Show and went on sale in 1959. To follow the progress of the world land speed record attempt, please visit www.triumphmotorcycles.com.